The research program of Yoba for Life is running in collaboration with a number of universities institutes and universities, including The Netherlands Organization for Applied Scientific Research (TNO), VU University Amsterdam (VUA) in The Netherlands, Wageningen University and Research Center (WUR), PATH, Seattle, USA, the Uganda Industrial Research Institute (UIRI) and Makerere University in Kampala, Uganda. Development of novel fermented foods with the Yoba starter culture, including cereals and fruits. Sustainable Food Processing Inspired by Nature. Novel Production Protocol for Small-scale Manufacture of Probiotic Fermented Foods. Westerik N, Wacoo AP, Sybesma W, Kort R. Novel Production Protocol for Small-scale Manufacture of Probiotic Fermented Foods. J Vis Exp. 2016 Sep 10;(115). doi: 10.3791/54365. Inactivation of bacterial pathogens in yoba mutandabota, a dairy product fermented with the probiotic Lactobacillus rhamnosus yoba. Genome instability in Lactobacillus rhamnosus GG. Sybesma W, Molenaar D, van IJcken W, Venema K, Kort R. Genome instability in Lactobacillus rhamnosus GG. Appl Environ Microbiol. 2013 Apr;79(7):2233-9. DOI: 10.1128/AEM.03566-12. Feasibility of A Novel On-Site Detection Method for Aflatoxin in Maize Flour from Markets and Selected Households in Kampala, Uganda. Paul Wacoo A, Wendiro D, Nanyonga S, Hawumba JF, Sybesma W, Kort R.
Toxins (Basel). 2018 Aug 11;10(8). pii: E327. doi: 10.3390/toxins10080327. Benef Microbes. 2018 May 25:1-10. doi: 10.3920/BM2018.0015. Probiotic Fermented Foods Introduction Enteric and diarrhealdiseases are a major cause of child mortality. A novel consortium of Lactobacillus rhamnosus and Streptococcus thermophilus for increased access to functional fermented foods. 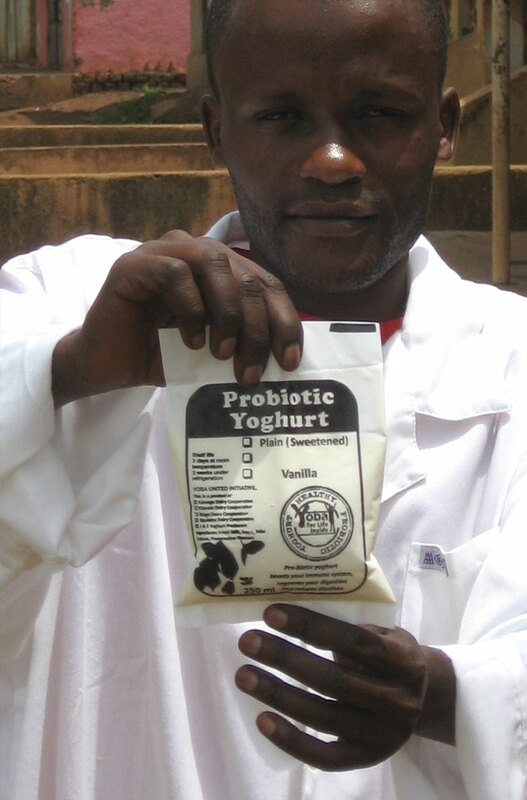 Locally sourced probiotics, the next opportunity for developing countries? Development of a locally sustainable functional food based on mutandabota, a traditional food in southern Africa. Mpofu A, Linnemann AR, Sybesma W, Kort R, Nout MJ, Smid EJ. Development of a locally sustainable functional food based on mutandabota, a traditional food in southern Africa. J Dairy Sci. 2014 May;97(5):2591-9. DOI: 10.3168/jds.2013-7593. Links to genome sequence data of L. rhamnosus yoba 2010, L. rhamnosus yoba 2012, one dairy product isolate containing L. rhamnosus GG and the reference strain, as carried out by use of the Breseq tool version 0.18 (3). Description Source Species Strain Culture collection nr. Novel name SRA BioSample accession no.a HiSeq Data MiSeq Data Ref. Kort R, and Sybesma W. 2012. Probiotics for every body. Trends Biotechnol. 30:613-615. doi: 10.1016/j.tibtech.2012.09.002. Sybesma W, Molenaar D, van IJcken W, Venema K, and Kort R. 2013. Genome instability in Lactobacillus rhamnosus GG. Applied and Environmental Microbiology. Published ahead of print 25 January 2013. doi:10.1128/AEM.03566-12. Barrick JE, Yu DS, Yoon SH, Jeong H, Oh TK, Schneider D, Lenski RE, Kim JF. 2009. Genome evolution and adaptation in a long-term experiment with Escherichia coli. Nature. 461:1243-1247. doi: 10.1038/nature08480.